skin, from the inside out You can spend hundreds—even thousands of dollars on topical moisturizers that help soften your skin. But if you want to truly give your skin the moisture it needs to maintain elasticity, strengthen collagen and minimize wrinkles and age spots, it’s a good idea to improve your skin conditions from inside out today. an obvious, dramatic improvement to your skin – age reversal in a sachet Giftbox - a potent combination therapy that uses high grade Collagen Peptide as base, also contains a unique concentration of natural active ingredients. These include L-Glutathione, Vitamin C, Natural Multiberry Juice Extracts, Beetroot Extract and Hyaluronic acid - results in dramatic improvements visible to your skin. The hectic pace of modern life, the passage of time, poor air quality and years of reckless sun exposure all too often show on our skin. The primary cause of skin aging and damage is genetic and environmental, attributable to the accumulation of errors in DNA from sun radiation, environmental toxins, less than perfect diet, sleep habits and emotional wellbeing. Only by enhancing the body’s natural ability to repair skin – a trait we are all born with but which is diminished by the passage of time - can this damage be reversed and new damage prevented. 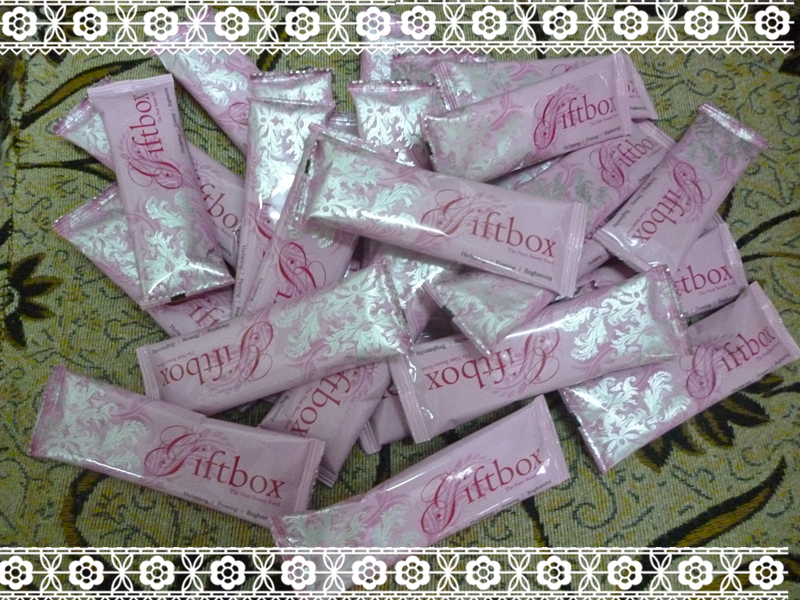 As an age-reversal beauty food, Giftbox is a marked-improvement over all existing products. Giftbox activates anti-aging genes, stimulating the production of new muscle, skin and collagen, repairing existing damage and protecting against future damage. Collagen Peptide - 2500mg Giftbox’s high grade Collagen Peptide is made from carefully selected fish and scale is highly purified, with low molecular weight for better body absorption rate resulting in better performance. L-Glutathione and Vitamin C - 200mg : 200mg L-Glutathione, also known as reduced glutathione or GSH, is a powerful antioxidant and detoxifier, which can be found in every cell in our bodies. However, as a result of the ageing process, stress and some chronic illnesses, levels of glutathione in our body can fall and this can make the signs of aging become obvious. When combined with Vitamin C in their optimum dose, L-Glutathione works from the inside to repair and nourish skin gradually. It improves skin hyper-pigmentations by suppressing the synthesis of melanin and increases the production of phaeomelanin, gives skin a radiant glow and a brighter tone. Hyaluronic Acid - 40mg Tremella Mushroom, also called Silver Ear Mushroom, is an ancient beauty secret for skin. It is rich with dietary fibers and Vitamin D. This natural source of Hyaluronic acid improves the moisture content of the skin resulting in improved smoothness and retained youthful looking skin.Traditionally Chinese women, including the legendary beauty Yang Guifei, have been taking Tremella Mushroom to make the skin moist, soft and pliable. Super Fruit Antioxidants-Multiberry Polyphenols Polyphenols in acai berry, blueberry, cranberry, maqui berry and raspberry have amazing skin whitening properties. These super berries are used as natural UV protection to promote skin brightening and to define the aging process. Q : Can PMS time consume giftbox ? Q : Can below 25 years old consume giftbox ? Q : Can pregnant ladies consume giftbox ? A : It's not advisable for pregnant lady to consume any supplement unless with doctor recommendation. Devil's Starts My GiftBox from September Onward! Stay Tuned with More Personal Review! Pink Packaging to cheer my day when i wake up now! !